Set in contemporary Jordan, Captain Abu Raed is a tale of friendship spreading generations. When Abu Raed, an airport janitor, finds a discarded pilot’s hat in the trash, he wears it and is soon spotted by a neighborhood boy who’s convinced Abu Raed is a pilot. Although reluctant at first, Abu Raed soon finds himself playing along with the neighborhood children in this fantasy, regaling them with stories from his “travels.” Soon, the children meet with Abu Raed on a daily basis to hear his stories. One day, however, it is revealed by one of the boys, Murad, that Abu Raed is in fact a janitor and not a pilot. One might think that the tale begins and ends there, but in fact, that is just the beginning. The film goes on to show how a forgiving Abu Raed impacts the lives of these children even after he is discovered by them to be a liar. The first Jordanian film to be exported for international cinemas, Captain Abu Raed is at times slightly cheesy, but it’s mostly heartwarming. Abu Raed might be a strange individual, but it becomes obvious very quickly that his heart is absolutely in the right place. Essentially, the film serves to paint a character portrait of him, the sweet, elderly next-door neighbor. 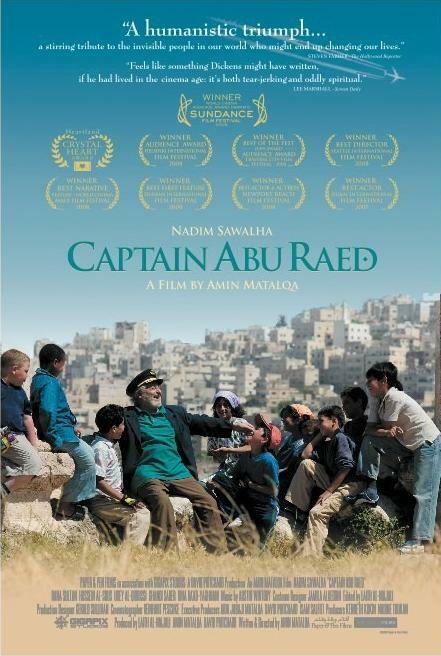 Captain Abu Raed is a well-paced film with characters that are easy to relate to. Although largely light-hearted, the film delves into uncomfortable territory at points with domestic violence and child abuse situations, but it is during these parts that Abu Raed’s character really shines through. Nonetheless, a good number of the other characters who are introduced in the film seem extraneous, and at some points in the film, it seems that there are a million directions in which the story can be taken. In fact, however, the film heads into surprising territory. The end result is a bit unpredictable and, to some, might feel inappropriate. But what is most notable about this film is the lighting. From frame to frame, the lighting is inconsistent, but each shot in isolation is fantastic. It almost seems as though the director, Amin Matalqa, prefers shooting photographs to films, and the quality of the shots only improve as the film goes on. Generally minimalistic in nature, the cinematography captures the understated architecture of a poor town in Jordan. Neon colors manage to appear in the most unlikely of places, with blue-hued lighting inside Murad’s home and yellow-hued lighting in narrow alleyways of the neighborhood. A tale of what happens when social classes collide and morals take precedence over self, Captain Abu Raed is a story from which dreams are made. In it, love and caring prevail over evil and anger, and one is reminded that human beings can sometimes be kinder than cruel.